All materials to make cards will be available. Meet in the craft room at the front of Wiseman House. Wiseman House Open Day, top floor open for inspection and available for rent. 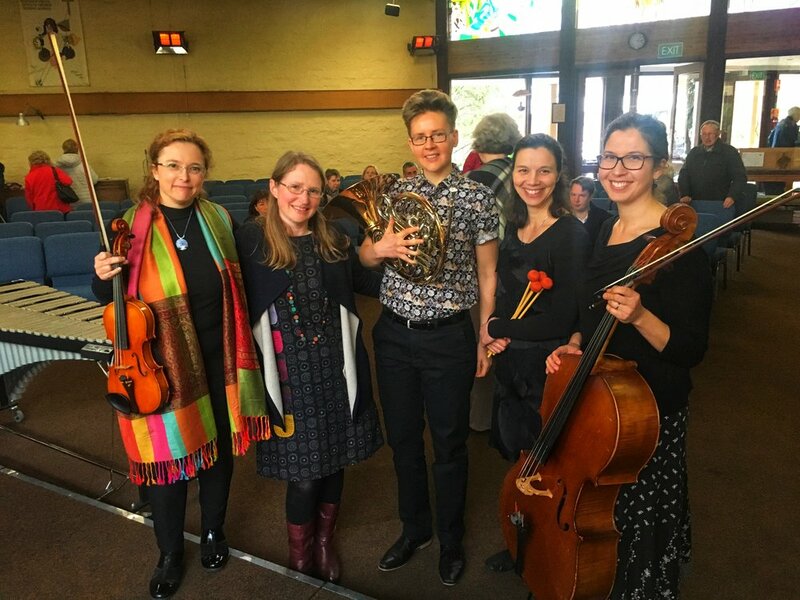 Marianne Rothschild (violin and bass violin), Karina Di Sisto, (cello) Luca Vanags- Smith (horn), Amy Valent Curlis (marimba and vibraphone), Katherine Rawlings (Composer). "Please join us for tea/coffee and a chat at the conclusion of the concert"
Please bring family and friends. Includes a large variety of delicious foods and entertainment. Informal service at St Linus’. No church experience necessary! First Sunday of the month 5-6 pm. Includes a light meal in our community hall. Last Sunday of the month 5-6 pm. It will be a combined service, joining the congregations of St Linus' & St Matthew's. Please pray for Sorush, Sonya, Sertug & Saheb who began their preparation in February. As usual our service on Sunday will include the Gospel read in Farsi and we will have a familiar hymn that we can sing in either Farsi (words on screen) or English. Anyone is welcome to attend and help us celebrate this joyful occasion. Working bee will take place following the 10:30am Service at St Matthew's followed by soup and rolls for lunch for those who participate in the working bee. There are lots of chores that need doing in preparation for the Bishop's Visit so please stay back for a little while after the service to lend a helping hand.